The oxyCLONE™ 20 site cloner works on the principle of re-circulating super oxygenated water created by the oxyHEAD pump. The oxyHEAD pump draws in oxygen from the atmosphere and produces turbulence to continuously nourish your cuttings. No spray jets to clog up and the water stays cool. 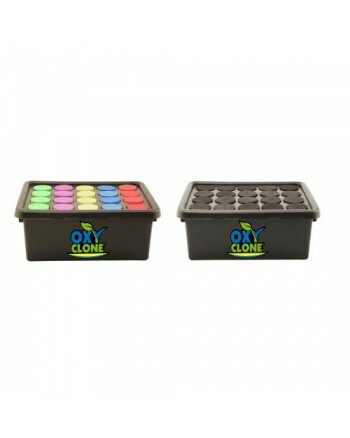 Kit includes 2 sets of oxycerts (20 colored and 20 black), 1 oxyHEAD pump; 1 molded cover and 1 impact resistant reservoir. Black light proof materials.